UK: Statoil, Statkraft and Masdar have completed the financing for the 402MW Dudgeon offshore wind project due to be installed in the North Sea by 2017. The project owners have arranged £1.3 billion (€1.6 billion) in financing from a consortium of banks, including the Bank of Tokyo-Mitsubishi, BNP Paribas, Siemens Financial Services and KfW. Construction of the project is expected to be completed by the end of 2017. A total of 67 Siemens 6MW turbines will be installed at the site 32 kilometres off the UK's east coast in the North Sea. The first monopile was installed at the project in April 2016. To date, 18 monopiles were installed. 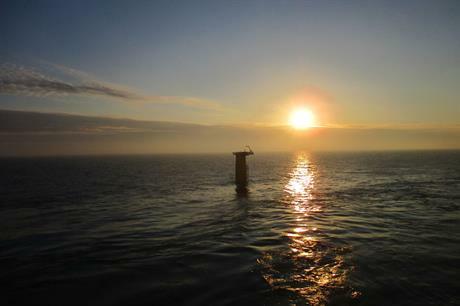 Dudgeon was one of five offshore wind projects to receive final investment decision (FID)-enabling contract for difference (CfD) support from the UK government in April 2014. The project will receive a guaranteed price of £150/MWh for the electricity it produces before falling to £140/MWh in 2018. Dudgeon follows Dong Energy's 258MW Burbo Bank Extension, 660MW Walney Extension and the 1.2GW Hornsea Project 1 developments — also supported by the FID-enabling CfDs — to complete financing. However, Statoil said Dudgeon is the first CfD-backed project to complete financing through third-party support. The fifth FID-enabling-CfD-backed project, Beatrice, is expected to make a final investment decision soon. In May 2015, the developers announced Dudgeon had reached a contractual milestone as part of the CfD programme. Sif Group, VBMS (formerly VSMC), JDR Cables, ABB, and A2Sea have all won deals at the project.